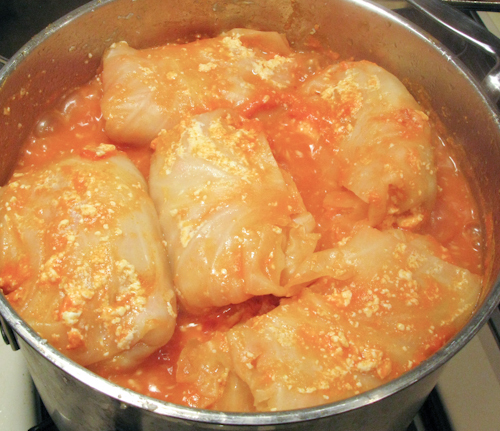 This is a very common household dish in Russia and other Eastern European countries that goes back quite a while. As with most other household dishes, there are many different recipes having different fillings, sauces, etc. 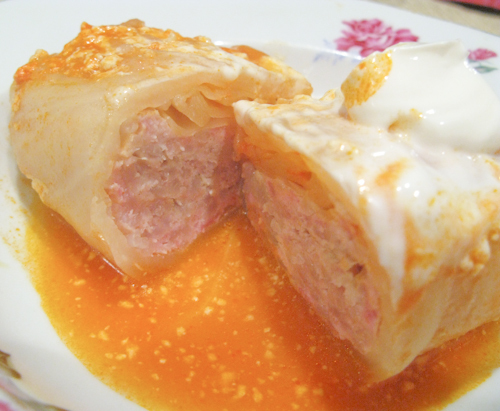 This recipe is the one that is prepared in my family and the results are quite good. 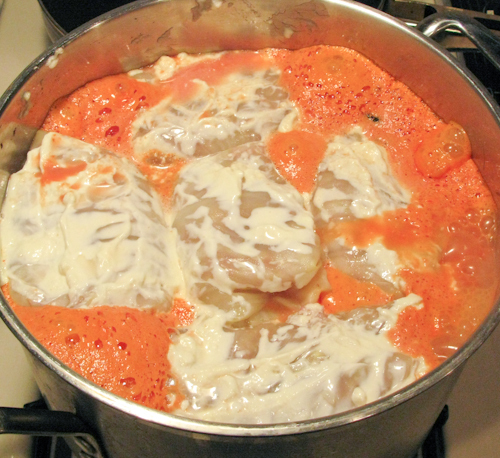 Firstly, prepare the filling for the golubtsi. 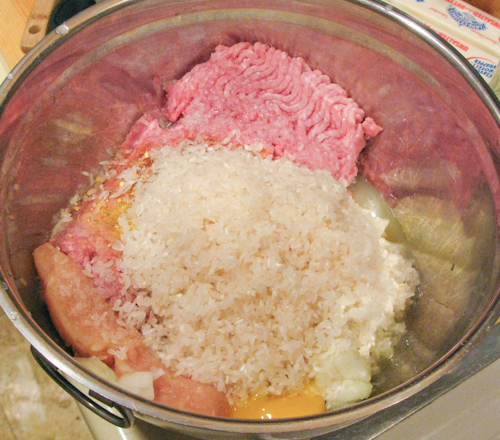 In a large bowl, combine the ground meat, onion, egg, salt, pepper, rice, and the seasoning (we used cayenne pepper and vegeta). 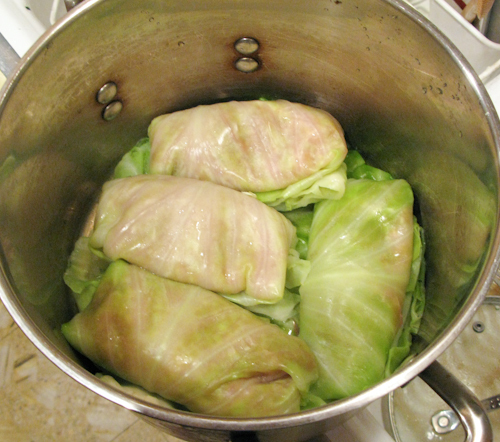 Now you have to prepare the cabbage leaves by softening them in boiling water. 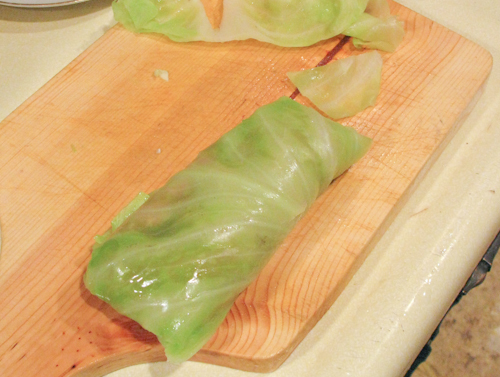 Cut out as much of the core of the cabbage as you can. You won’t need this part, and it will make it easier to remove the leaves later. 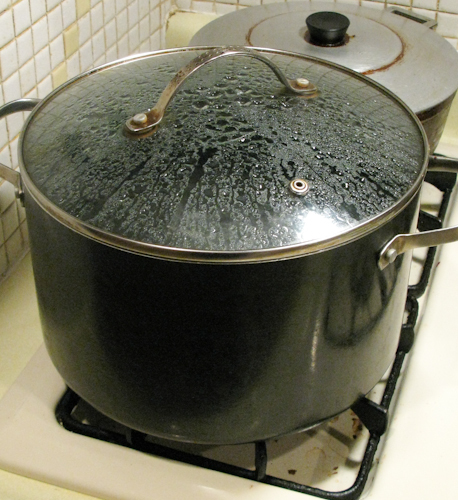 Bring a large pot, filled half way with water, to a boil (putting more water in will make the pot overflow). 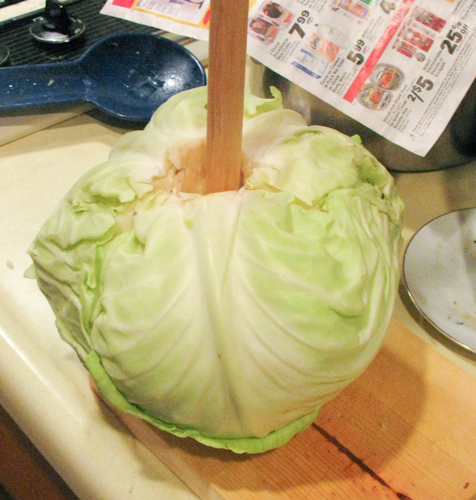 Use two forks to pierce the cabbage at the bottom, it will make handling the hot cabbage a lot easier. We used a special tool we made which is essentially a serrated, pointy stick. 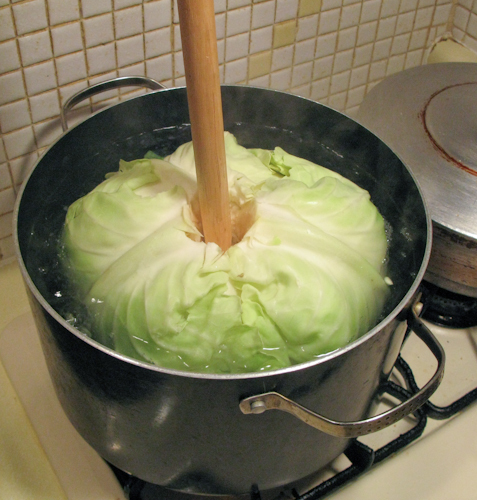 Place the cabbage into the pot and boil for about 10 minutes. You’ll be looking for the outer leaves to get soft. 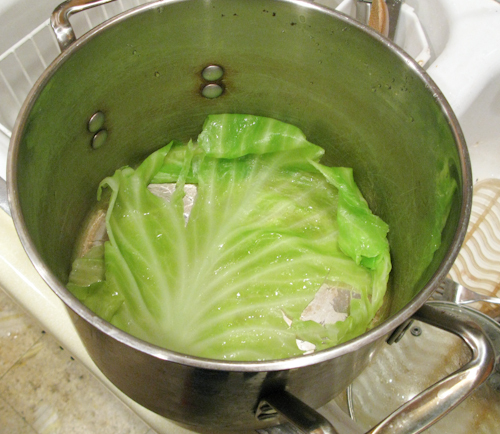 Carefully remove the cabbage from the pot (be very careful, it’ll be dripping with scolding hot water) and place in a large plate. Carefully remove all the soft leaves. 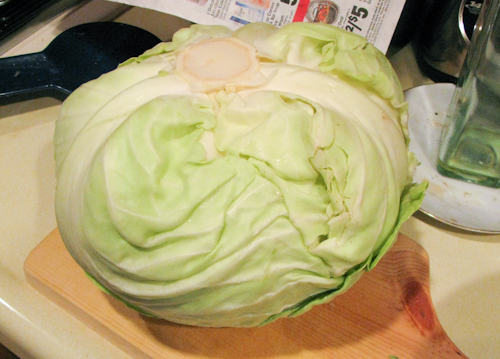 Once you get down to the layers that are still hard, put the head of cabbage back in the boiling water. Repeat until you’ve removed all of the large usable leaves. After you’ve gotten enough soft leaves, you may need to cut out the hard parts of the leaves at their bases. 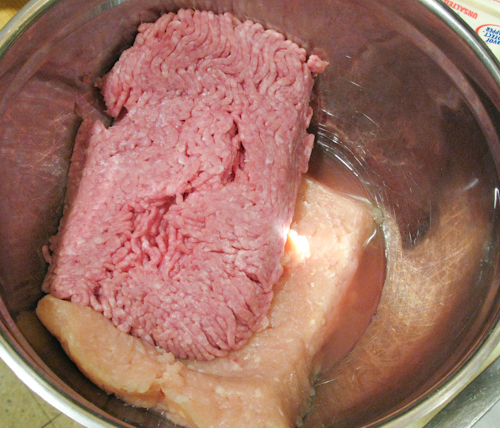 Alternatively you can soften those parts using a meat mallet. 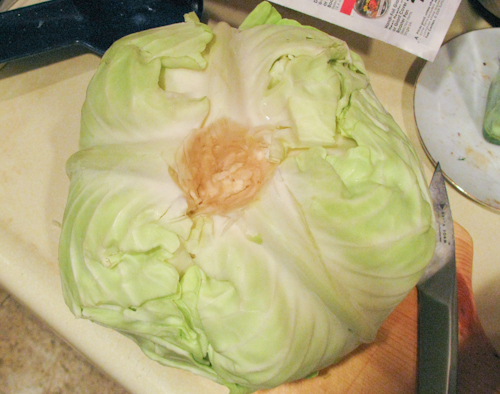 In another large pot now, line the bottom of the pot with one large sheet of the cabbage. Stack the golubtsi inside this pot in layers. 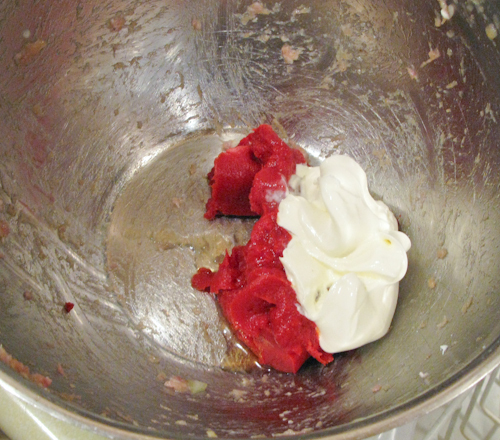 Coat each layer in a thin coat of mayonnaise. 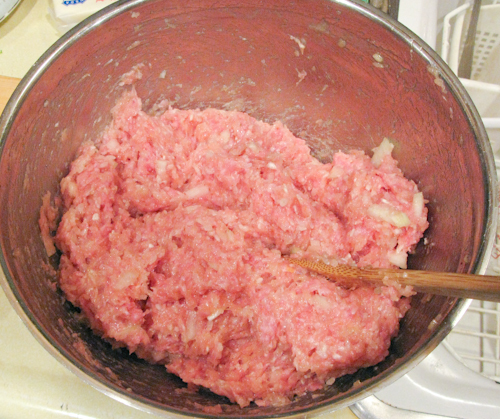 In the bowl you used for mixing the filling, combine the tomato paste and a table spoon of sour cream with 2-3 cups of water, 1 tea spoon of salt, and a table spoon of sugar (adjust to taste). 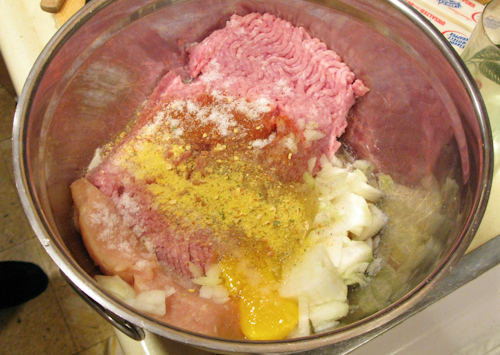 Mix this until uniform and relatively thin. Pour over the golubtsi and add more water to the pot until the golubtsi are almost submerged. Cover the pot, and place on the stove on high heat. 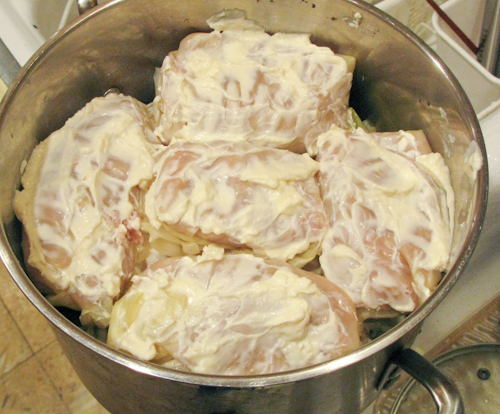 Bring to a boil, lower the heat to low and cook for 1.5-2 hours. 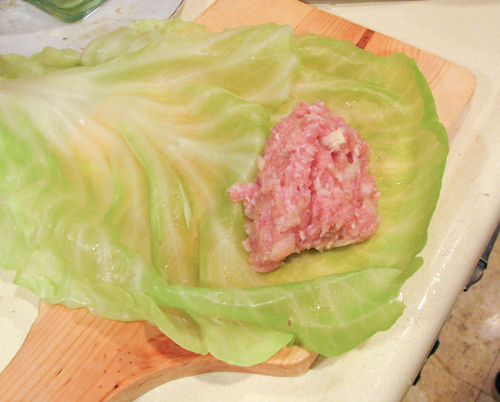 The filling should be cooked through and the cabbage leaves soft enough to melt in your mouth. And you’re done! 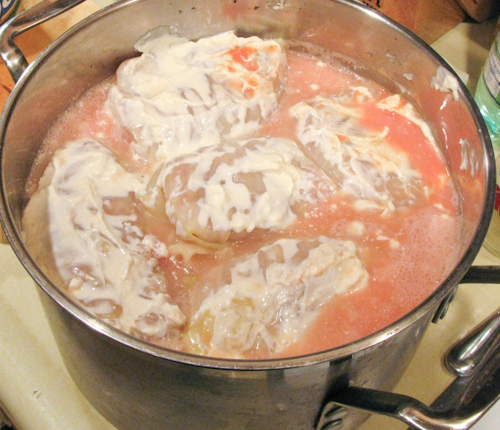 Serve warm with the sauce they cooked in and a spoon of sour cream. Posted in: Beef, Chicken, Holiday, Lamb, Meat Dishes. I had a hard time taking a “cute” picture of my golubtsi for my blog; they just aren’t pretty, but they taste fantastic! Your picture turned out nice. Looks very appetizing. I will try this recipe, it just looks/sounds really good. After having many russian friends and becoming temporary adopted children to their mothers during meal time and spending a few months in siberia early this year, I have a very strong craving for these now and then… and its a point of pride if I “develope” my own exact recipe rather than ask every russian Mama for hers. Or at least I should say that if my wife tastes mine and they’re different from her mothers but she likes them, it will be more impressive… hahah. Is there a reason you use mayonaise? You use mayo for flavor. There are a variety of recipes that do no use mayo, it’s really up to personal tastes. Everyone who’s ever tried these have loved them. No matter where I look I cannot find cabbage with such good firm thick leaves as you have on the picture. When I tried to submerge a cabbage in boiling water, the leaves were overcooked and transparent after virtually 3 minutes! I found mayo an excellent addition to the recipe!! :) Also, do you ever put other veggies like carrots, celery, tomatoes in the nachinka as well? The leaves only need to be soft enough to work with, the boiling process is only to soften them, so if you’re starting with softer leaves it’s less work for you 😉 I’ve never had golutsi with veggies in the nachinka but I’m sure it’d taste great. I was practically adopted by a wonderful Russian/Ukranian family during college and long after while I was back in Virginia. I learned to make these and fell in love! Only difference was that she would fry onions, garlic, carrots and the tomatoes while the cabbage was boiling, then use that to pour over the golubtsi – had never heard of using mayonnaise before so I plan to try that next time I make them. I really appreciated the hints on how to work with the cabbage because that’s always been the hardest thing about making them for me! You’re right, it didn’t mention rice, but it is in the pictures. It should have been included in the very first step (I updated the recipe). The rice is uncooked but washed. 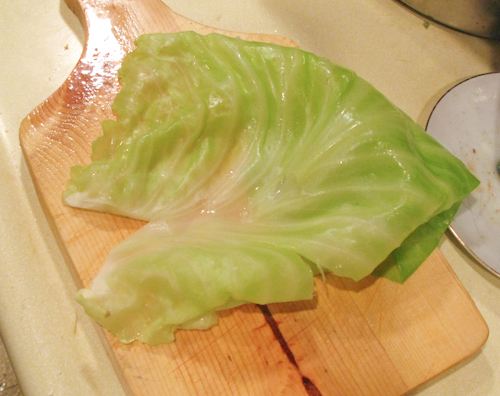 There are no leaves of cabbage between layers, just 1 at the very bottom. Your photos of your golubtsi is sure appetizing! 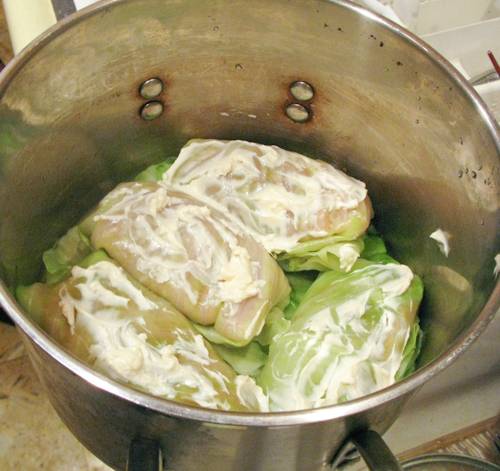 I had a hard time setting the boiling time right in my first try, the cabbages come out limp. I hope I can do this right next time. 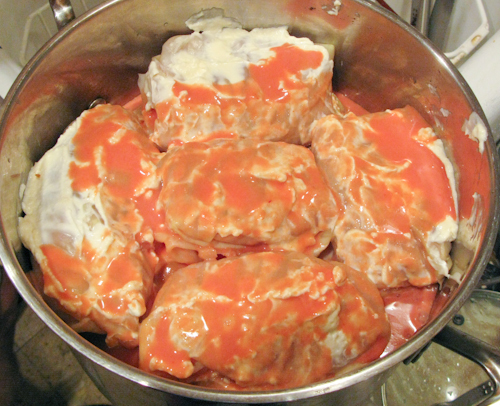 I have sped up the process by using already cooked rice with the meat, adding sour cream to the meat mixture,and several tablespoons of worchestershire sauce. 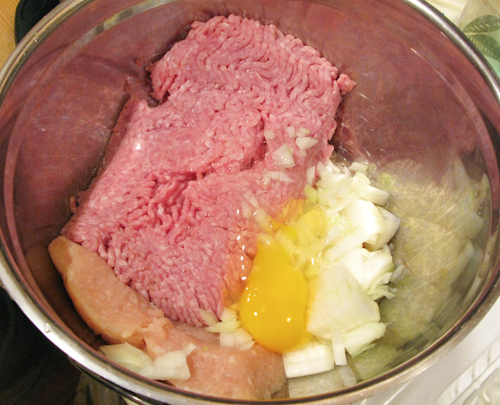 I layer the haluptsi in a casserole dish and cover with spagetti sauce. Bake in 325 oven for an hour or so. No mayo, but lots of smetana and dash of Red’s hot sauce on top.